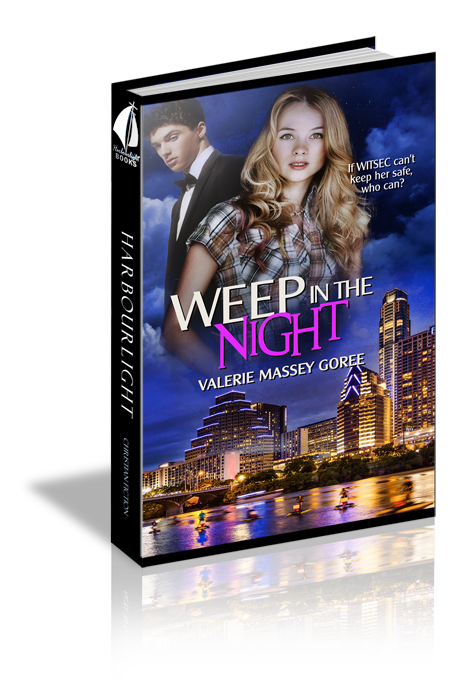 After three years in the witness protection program, Sadie Malone’s life in Texas is bland and humdrum--until she meets a new co-worker. Bowen Boudine ignites a flame in Sadie's long-dormant heart, but when she discovers he knows her true identity, she attempts to flee. He thwarts her escape and reveals the reason he’s been sent to locate her. Bowen, a seasoned operative with International Retrieval Organization takes his job escorting Sadie safely back to California seriously, but quickly finds he's falling for her. Can he maintain a professional relationship while he protects her from the crime boss her testimony helped to convict? She ran her finger across the white plastic nametag. Blue letters spelled out Debra Johnson, but that wasn’t her name. The bulb above the sink crackled and died. She hated the dark. Backing out of the bathroom, she leaned against the wall and flipped on the hall light. Shadows scuttled away, but left a trace of unease in her gut. Tears blurred her vision as she pinned the nametag on her shirt. It took two attempts to snag the pin in place. Get a grip, Sadie. You’re safe. Although she’d been in the Federal Witness Protection Program for almost three years, she still thought of herself as Sadie Malone. Sometimes the past latched onto her soul and yanked her down to the depths of grief like a meteor plummeting to earth. Today would have been her husband’s thirty-seventh birthday. She closed her eyes. The faces of Aaron, and Hannah, her four-year-old daughter, floated in and out of a gray mist. Gone. They were both gone. A shiver took control of Sadie’s body as ice crystals formed in her heart. She would not succumb to despair. Clenching her jaw, she hunted in the closet for a new bulb and installed it. Light cascaded as she glared in the bathroom mirror, chest heaving, and the corners of her mouth pointing south. The hall clock chimed the hour. Nine o’clock. Sadie squared her shoulders and opened her cosmetic bag. No matter her emotional state, she needed to leave soon. Miles Griffin, her local WITSEC contact, had found her the job and would be disappointed if she got fired. Dabbing on makeup, she paid special attention to her red-rimmed eyes. Couldn’t have curious co-workers bugging her with questions. Sadie brushed her hair and arranged the short blonde curls to cover the dark roots. Time to schedule an appointment with Yolanda, but it would have to wait until her next day off. Dyeing her hair took time and money, which she sacrificed without complaint to keep her whereabouts secret. Satisfied with the makeup’s camouflage, Sadie headed to the kitchen for her salad sack lunch. She’d much prefer to eat a burger and fries, but patted her flat stomach and closed the refrigerator. No way would she gain back the weight she’d lost since being in WITSEC. Dressed for work in blue jeans, aqua T-shirt, and sneakers, she slid the nonprescription glasses on her nose and glanced in the hall mirror. The wire-rimmed frames changed her appearance. She sure didn’t look like Sadie Malone anymore. When she stepped out of her corner, ground-floor apartment, she scanned the area for loitering strangers or anyone out of the ordinary. The whine of a power mower filled the air with the sweet smell of cut grass. Mrs. Gaffney watered plants by her front door; Lloyd Kaiser tinkered with his bicycle in front of his apartment, three doors down; Jodie Powers walked her pug. All familiar, all OK.
With a satisfied nod, Sadie took the sidewalk to the parking area and climbed into her white mid-sized sedan. The economical, inconspicuous vehicle matched her circumstances. In it, she could be as invisible as possible. At times, she missed her SUV, but with no little girl to buckle into a carseat and no husband to laugh and talk with, the smaller vehicle suited her needs. As she drove to Rhodes DIY Headquarters, a local home improvement store, she fingered her nametag. Debra Johnson wasn’t the only name change she’d had. Right after the trial in Los Angeles, still grieving for Aaron and Hannah, she’d been whisked to Seattle, known there as Sadie Mason. She parked in the employee lot and glanced at her short nails as she removed the key from the ignition. At least in Seattle she had an office job. But her identity there had been compromised. Now, here in Austin, Texas, she worked at Rhodes in the garden center. Dirt under her nails, rough hands, aching back—nothing like her original job in technology. Computer expertise led to her placement in WITSEC. That meant no jobs in the computer industry for her ever again. At least she had friends at Rhodes. She took a deep breath of the crisp morning air, still earthy from the overnight rain, and entered the store. Once in the break room, apron on, Sadie clocked in. Several people milled about. April still referred to Reece Patterson as Sadie’s pastor, although she’d attended Hillcrest Church for six months. Sadie had only been going there a few months longer. Her church activities had ceased two and a half years ago when her family died. Attendance now wavered between enthusiastic and perfunctory, a result of guilt and a gnawing vacuum where her soul used to be. With a nod, April held the door for Sadie, and they left the room together. “No, I haven’t seen this new, hot guy.” After all that had happened, meeting men, good-looking or otherwise, was not high on Sadie’s priority list. Since the car accident that killed Aaron and Hannah, she had little interest in a romantic life. Her routine consisted of work, developing a few friendships, and most important, staying safe. A jab in the ribs brought her back to the wide store aisles. “There he is, Debra. Over there.” April pointed to a group of men examining a stack of cedar fence posts. The men concluded their discussion and the new guy turned, heading down the aisle. Eyes on the approaching figure, Sadie had to agree with April. Muy caliente, indeed. About average height, thick black hair—a stray curl flopped on his forehead—and an athletic body. He beamed a hundred watt smile at April. “Hi.” His deep voice complemented his physical appearance. Sadie frowned at April’s retreating figure. The man turned to Sadie. A dimple in one cheek enhanced his rugged face. “Hi, April’s friend. I’m Sam.” He extended his hand. “Garden. And I’m sorry I can’t stay and chat. I have a load of star jasmine waiting for me.” She sent him a plastic smile she was sure never touched her eyes and hurried away. Sam. His name was Sam. A lump of sadness slid down her throat. Because of her initials, her husband’s nickname for her had been Sam—Sadie Aretta Malone. Although the arrival of plants and other merchandise kept Sadie busy, she couldn’t shake the recurring waves of melancholy that shadowed her. No matter how much she tried to avoid the new guy, he appeared at every turn, reminding her of happier days. Why did his name have to be Sam? He attempted to strike up conversations, but the early spring rush provided believable excuses for Sadie to escape. Her ploy worked until lunchtime. She opened the break room door and scanned the crowded area. Oscar munched on popcorn, the charred, nutty aroma announcing he’d burnt it again, and someone had heated a fishy meal in the microwave. Sadie wrinkled her nose. Sam sat alone at a small table wedged beside the counter. A pile of sandwiches spilled out of his lunch box. One foot rested on the single unoccupied chair. With eyebrows raised, he glanced her way. “Hey, Debra. Want to join me?” He set his foot on the floor. Salad bowl open, she mixed in Italian dressing. Stay away from his eyes. But she couldn’t help it. Their blueness intrigued her. Were they real or did he wear colored contacts? Focusing on her bowl, she chomped on lettuce, the tangy dressing enlivening her taste buds. Sam picked up another sandwich and set his elbows on the table. “So, Miss Debra, how long have you worked here?” His dimple appeared again. Thankful her eyes were focused on the last of the salad, Sadie kept her head down. First, his name brought back memories. Now, two more troubling coincidences. She’d been raised by foster families and moved more times than she could remember. And she had been born in Dayton. Anyone observing her exit would have thought Freddy Krueger chased her as she ran from the break room. Not knowing what else to do, she punched Miles Griffin’s speed dial number on her cell phone. Griff listened to her concerns about the new guy. “Good instincts, Debra. Glad you called. Find out his last name and any other personal information you can scrounge. I’ll do a bit of checking.” Talk about a Texas twang. Griff’s words drawled out as if he had a limited number and had to make them last all day. “Always do. Thanks, Griff.” She slipped her phone into her apron pocket. Oh, joy. Now she’d have to talk to the new guy again or find another way of snooping for information. And she’d have to call him Sam—he couldn’t be the new guy forever. Opportunity came when Sadie clocked out at ten after six and had the break room to herself. Rhodes still used time cards, which were listed alphabetically in the metal holder. After returning hers to its slot, she checked for Sam’s. It took a while but she located a card for Sam Boudine. She tugged her purse and lunch sack from her locker and jotted down Sam’s name. As she turned to leave the room, he entered. Every fiber in her objected, but she waited for him to clock out. While considering other questions she could ask to garner personal information, he continued the conversation and provided a cache. “So you don’t have any family down here?” Now outside, she elongated her stride to keep up with his long legs. Antennae now on full alert, Sadie rummaged in her purse for her keys. “What happened?” She expected to hear about a divorce, but his next words stunned her. Just like her family. Goosebumps pinpricked her arms. To hide her alarm, she pressed the car remote. “Allow me.” Sam opened her door. “That’s really sad.” Sliding into the car, she threw her purse onto the passenger seat. With his wallet already out, she had little choice. An attractive brunette holding a dark-haired toddler stared back at her. Words clogged her throat. She glanced up at him and her heart twisted at his pained expression. Guilt for her earlier rudeness and for talking to him only to collect information needled her conscience. But her heart did more than flutter at his next words. It jerked to a stop.